Ezer Weizman (1924-2005), the nephew of Israel’s first president, Chaim Weizmann, was born in Tel Aviv and raised in Haifa. In his youth, he joined the Haifa Aviation Club and was flying planes by age 16. At 18, in the midst of World War II, he enlisted in the British Royal Air Force and served in Africa and India. After the war, Weizman lived in London and studied aeronautics. It was there that he joined the Zionist paramilitary group, Irgun. Weizman returned to Israel to fight in the Independence War. He was one of Israel’s very first fighter pilots, co-founded its air force, and participated in the first air force mission. He continued working for the army after the war, and in 1958 became the commander of the Israeli Air Force. He modernized the IAF, personally trained its pilots, and transformed it into the powerful and feared juggernaut that it is today. In 1967, Weizman was the IDF’s chief of military operations, and helped persuade the Israeli government to launch a preemptive strike against its aggressors. He directed the surprise attack on Arab air forces on the first day of the Six-Day War, totally destroying their air power and thus securing Israel’s lightning victory. (It has been said that the Six-Day War was won by the Israeli air force in the first six hours!) In 1969, Weizman – now a major general and deputy chief of staff – retired from the military and joined the Gahal political party (the precursor of Likud). He served as a Minister of Transportation and later as Defense Minister. He oversaw the development of Israel’s Lavi fighter jet, and the critical 1978 campaign in Lebanon (Operation Litani). Meanwhile, Weizman also became an important peace negotiator. He spoke Arabic fluently, and grew close to Egyptian president Anwar Sadat, who went so far as to call Weizman his “younger brother”. Not surprisingly, Weizman played a key role in Israel’s 1979 peace treaty with Egypt. He later founded his own party, Yachad, and sat on the Knesset between 1984 and 1992, serving as Minister for Arab Affairs and Minister of Science and Technology. A year after leaving the Knesset, Weizman was elected Israel’s seventh president. By this point, he had built a reputation as a dove, and worked hard to promote peace. He was credited with making the office of president more relevant in Israeli society, and was praised for his warmth and concern for all of Israel’s citizens, including Arabs and Druze. 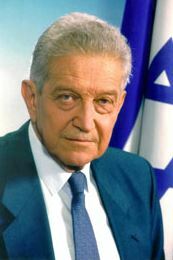 After being reelected to a second term, Weizman resigned as president in 2000, and passed away five years later. He has been voted the 9th greatest Israeli of all time. There are free men with the spirit of a slave, and slaves whose spirit is full of freedom. He who is true to his inner self is a free man, while he whose entire life is merely a stage for what is good and beautiful in the eyes of others, is a slave. This entry was posted in Law, Politics & Military and tagged Africa, Camp David Accords, Chief of Staff, Egypt, Gahal, Greatest Israelis, Haifa, Haifa Aviation Club, IDF, India, Irgun, Israel, Israeli Air Force, Knesset, Lavi Fighter Jet, Likud, London, Major General, Member of Knesset, President, Royal Air Force, Six-Day War, Tel Aviv, War of Independence, World War II, Yachad, Zionist on June 7, 2017 by Jew of the Week.